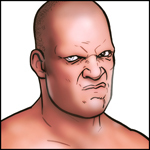 -- The final Raw of 2011 concluded with Kane explaining the storyline of why he targeted John Cena. Kane's scripted explanation was that he wanted Cena to "embrace the hate" from anti-Cena fans rather than try to "rise above the hate," as his t-shirt indicates. The episode concluded with Cena standing on the stage listening to dueling chants before hanging his head. -- WWE champion C.M. Punk vs. Dolph Ziggler for the WWE Title was announced for next week's first Raw of 2012. Ziggler pinned Punk in a gauntlet match in Punk's hometown of Chicago to earn the title shot. -- R-Truth returned to TV after a 30-day suspension. Truth attacked The Miz, who "injured" Truth for the write-off to serve the suspension. In a crazed promo, Truth vowed to attack Miz every Monday on Raw in 2012. -- Alberto Del Rio made a non-wrestling appearance in a wheelchair to turn his injury on last week's Raw into a storyline explanation for his upcoming absence to recover. -- The final Raw Mystery Vignette aired pointing to a return on next week's Raw. The girl in the vignettes noted the Powers That Be will be shaken when the "boy" returns. The final text read, "The End Begins. Next Monday." -- Raw authority figure John Laurinaitis advertised Brodus Clay's TV return next week on Raw. It came across more definitive than previous weeks when the return was teased and did not materialize. -- During two commercial breaks, a 30-second spot for the UFC 141 PPV aired focusing on former WWE wrestler Brock Lesnar's MMA return fight against Alistair Overeem on Friday. -- The top match advertised for Friday's Smackdown is Randy Orton vs. Wade Barrett in a Falls Count Anywhere match to conclude 2011. Also advertised in a generic TV spot is more focus on Daniel Bryan being in jeopardy as World Hvt. champion. -- Booker T made an unadvertised in-ring appearance, defeating IC champion Cody Rhodes in a 12-minute match. Although not made explicit, the match was presented as a farewell match for Booker, who had a long celebration after the match. -- WWE did not mention their next PPV, the Royal Rumble, other than in a standard video package in-between commercial breaks. The show was more of a "year-end wrap-up" one month before the Rumble.